Alice Roosevelt Longworth lived her entire life on the political stage and in the public eye, earning her the nickname "the other Washington monument." In this new biography--the first in twenty years--Stacy A. Cordery presents a detailed and richly entertaining portrait of the witty and whip- smart daughter of Teddy Roosevelt. "Princess Alice" was a tempestuous teenager. Smoking, gambling, and dressing flamboyantly, she flouted social conventions and opened the door for other women to do the same. Her husband was Speaker of the House Nicholas Longworth but--as Cordery documents for the first time--she had a child with her lover, Senator William Borah of Idaho. Alice's political acumen was widely respected in Washington. She was a sharp-tongued critic of her cousin FDR's New Deal programs, and meetings in her drawing room helped to change the course of history, from undermining the League of Nations to boosting Nixon. During the Kennedy and Johnson administrations, her legendary salons were still the center of political ferment. 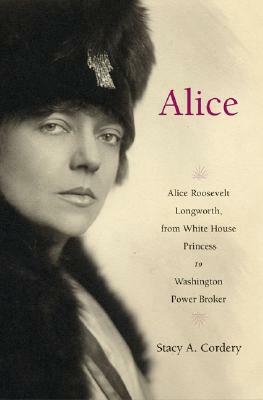 With new insights into Teddy Roosevelt, and for everyone who delights in Washington history and gossip, Alice is a fascinating portrait of a woman who influenced American politics for nearly a century.